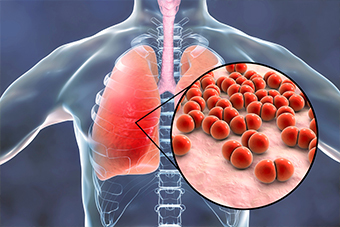 Doctors and primary care nurses are being urged to reinforce the message that vaccination is the most effective way to prevent Streptococcus pneumoniae, responsible for an estimated 20% of pneumonia cases in Australia. Read more: Infectious diseases researcher, Dr Rob Menzies says a healthcare professional’s recommendation to vaccinate, or otherwise, is the most influential factor determining whether a person chooses to protect themselves. “We’re achieving a 93% pneumococcal vaccination rate among Australian children … yet we’re failing to achieve even a 50% pneumococcal vaccination rate among equally vulnerable seniors,” he writes in an opinion piece in MJA InSight. The most recent data suggest pneumococcal vaccination coverage has actually declined to 47% in NSW, he adds, with more than half of these vaccinations occurring after 70. Dr Menzies says doctors should be looking to opportunistically vaccinate those at risk of pneumococcal pneumonia. The 23-valent pneumococcal polysaccharide vaccine (23vPPV) is provided free under the National Immunisation Program Schedule. The 13-valent pneumococcal conjugate vaccine (13vPCV) is funded for all children, but in adults is recommended (but not funded) only for those with immunocompromising conditions. Inclusion of 13vPCV under the NIP for all people aged 65 years and over is under consideration.